Those of you that have been following this blog for a while already know that I left the shipping container roof exposed on the inside and insulated it on the exterior instead. There were a couple of reasons for this. First, I wanted to preserve as much vertical space as possible in my cabin. Second, I actually like the look of the corrugated ceiling. 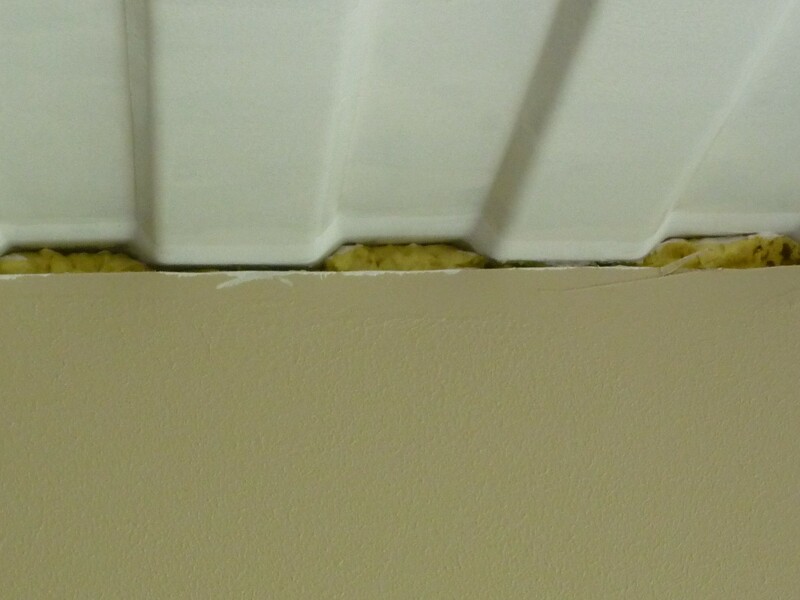 There was one problem with this design choice however; how to trim a ceiling with corrugations. 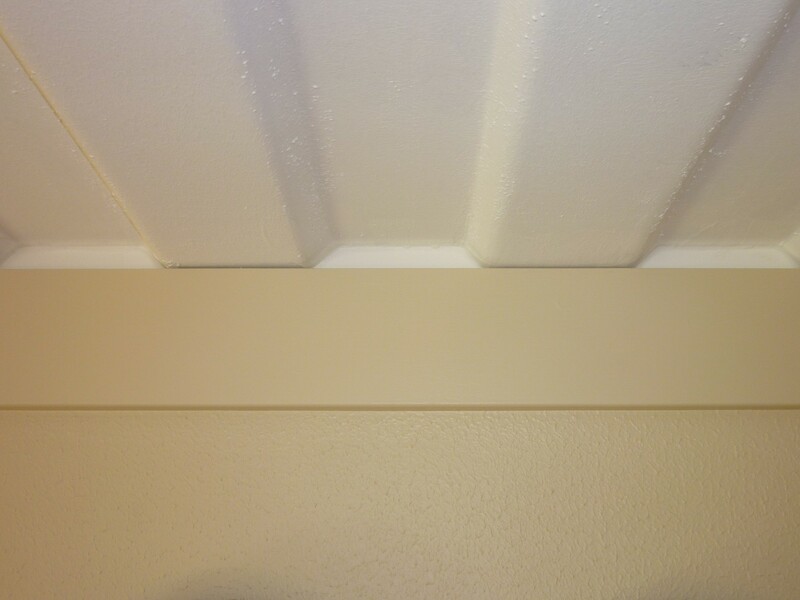 One method I have seen employed before (which I think has the nicest appearance) is to cut and finish the drywall to fit within the corrugations. The problem with this, from my standpoint at least, is that I’m a rank amateur when it comes to drywall and it would have taken too much time and probably not looked very good in the end. If you’re hiring a professional drywall finisher in the first place, this would probably be the best way to go. Another option I almost went with, and even bought the tool to do it, was to scroll saw the corrugated pattern out of the trim itself. At first glance it might seem like a good option, but I found out that the corrugations are not consistent in either the horizontal or vertical planes. I would have had to trace every corrugation onto the trim with some sort of vertical offset jig. 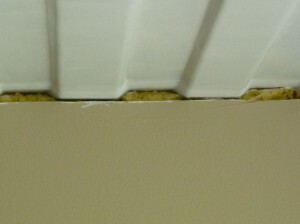 In addition to that, my trim boards for the non-corrugated walls would have needed their heights trimmed down to match. Thankfully I came to my senses just in the nick of time. What I did instead, which ended up being very easy, was to install thin aluminum tabs behind the trim boards that extended up into each corrugation. I first made a template that would fit into the upward portion of a corrugation and overlap a few inches onto the drywall. The tabs were then cut from aluminum step flashing using the template. I ended up needing 50 tabs total for both side walls of the cabin. Cutting the aluminum with Fiskars Shop Snips was much easier than I thought it would be – almost like cutting heavy poster board with scissors. For convenience sake I painted the tabs before I put them in place, although I’m sure they could have been painted afterwards as well. I affixed the tabs to the drywall using Loctite Spray Adhesive. It did take a few tries to figure out the right amount to spray on both the drywall and the tabs so they wouldn’t fall off. After the tabs were glued into place, I caulked the seams between the tabs and the ceiling, and screwed the prepainted trim boards to the wall. A word of warning to all the perfectionists out there, of which I’m one; this is not a “perfect” solution. As I mentioned before, the corrugations are not vertically consistent. Some of the downward corrugations abut the trim boards, while others have about a 1/8″ space between them. Overall, it does look really nice and I’m pleased with my choice. I plan on having some pics of the finished interior up in the next few weeks, so you’ll be able to see everything in context then. It looks amazing. Great job and I love your blog. I would like to ask about sound issues. In my container house, the builder is planning on putting pine tongue and groove on the ceiling. He originally wanted to do a popcorn ceiling (bah!) to dampen sound. I really like the look of the original ceiling, but he said it’d be too loud. I will have concrete floors and lots of glass, so I do understand the sound issue, but wondered if you had a lot of reflective sound due to your ceiling. I don’t find my bare ceiling loud at all. I also have laminate floors that should contribute to the reflection. I guess a lot depends on how much noise you plan on making. I’m wondering if something expansive that could be “finished” would work, such as rope caulk that could be pressed into place, shaped and left to harden? While it could work, I think the amount of time necessary to do this would make it impractical. It was just so easy to cut these tabs out of the aluminum step flashing and glue them in place that I would definitely do it again. The finished look has also grown on me without any regrets – unlike some other things I have done. Build with property taxes in mind. By leaving all the interior painted metal, at least until after it is inspected, you lower the assessed value. So put in the bare minimum of partitions and do not panel the inside until after it is inspected.